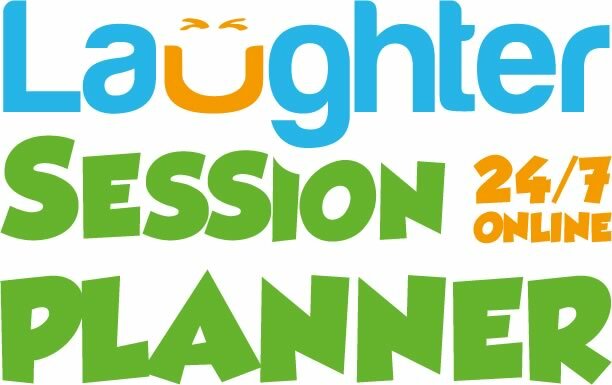 The online laughter session planner is an online database of over 1,001 exercises, activities and games that can be used during laughter programs. What is unique about it is that these exercises are grouped in 10 main categories and searchable using 24 different selection criteria, all within a user friendly interface that’s available 24/7/365, from your computer, tablet, or mobile device. Planning high quality short laughter sessions or day-long workshops has never been easier. The online laughter session planner is the ultimate tool for complete beginners and seasoned laughter professionals alike. Discover the coolest 21st century tool to unearth your mirth, consistently! No more spending untold amount of time and resources to find old or new joy-filled exercises for yourself and your group activities! What are the 10 exercise categories and what is in each? + Floor laughter exercises for the laughter meditation. You could use all exercises in this category back to back if you had the time. Answers to common challenges faced by Laughter Professionals. What are the 24 selection criteria and what do they mean? All exercise programs follow the exact same sequence. 2. Show: this is an important step in creating a strong group dymamic. You review and practice as a group what’s going to happen and how to transition together between activities. 3. Do: dynamic exercises go here, delivered within the framework that you established in step 2. Energies flow outwards. 4. Integrate: this is about deepening the impact you what you have done in step 3. Energies flow inwards. Joy manifests itself in three steps. 2. >5 minutes: these are playful exercises that young children will usually be willing to practice without any laughter warrmup, but not adults. A typical example is the peek-a-boo laughter where you hide, then reveal your face as you laugh. They are too far away from an acceptable adult behavior to be just “amusing”. Always practice safe exercises for a minimum of five minutes before you get into play mode, or prepare to be judged as an odd ball. 3. >10 minutes: these exercises have no frame of reference in everyday life. They invite you to behave like an extreme eccentric and move and/or sound like an animal, alien, or fantasy character. A typical example is the tongue trick laughter where you are invited to laugh as you do your funniest tongue trick. This kind of exercises are lots of fun and very therapeutic (they help disolve inhibitions very quickly) but practice with caution, only if you feel that your group is ready for them. Have you ever been asked to laugh with a group of wheel-chair bound individuals, or on the radio where nobody can see you? A. Almost None: no physical movements are required for this kind of exercises. They are wheel-chairs and hospital beds friendly! B. Easy: these exercises are low-impact and can be practiced by the majority of the population. C. Harder: you need a healthy body, good balance and a strong heart for this kind of exercises. None required: Do these alone or with 1 million people if you wish. Partner activity: exercises for 2 people working together. Team activity: exercises that need teams of people.